and recycled tin cans. A original DIY for Deco chic table or elegant bedside table and flowers for almost nothing! It is time to decorate the house with beautiful flowers and we think about decorative ideas that will change the traditional glass or porcelaine vase. For this, we manufacture unique vases and great decor using recycling items, it’s cheap and stylish too! 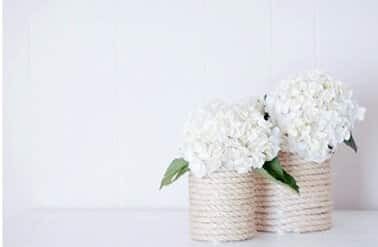 With this DIY found on Pinterest, ultra easy, discover how to quickly make a vase . 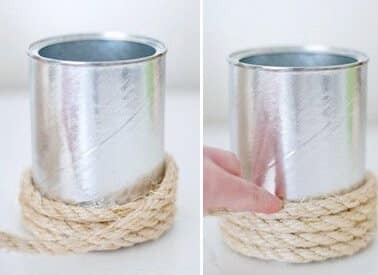 You only need a coil of rope and a tin can . Add pretty flowers in your vase and presto, here’s a nice decor to exhibit on the dining table, on your desktop or on your bedside table for a successful deco, fresh and flowery! like in this this post or select a colored cord if you want to match the color of your vase to a color already present in the room. The important thing is that the rope is easy to handle. 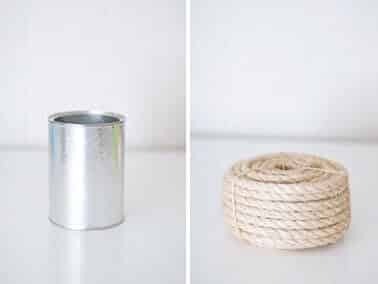 Wrap the rope properly and securely around your metal box by fixing the end with a dot of glue on the box. Tighten and feel free to add some glue on the edges in order to keep the rope in place around the can. Let dry a few minutes. Finally, fill your vase with pretty seasonal flowers to decorate your home. Put your vase on your table in the dinner room when you host guests for a discreet and refined décor, and then expose your flowers on your bedside table to decorate your room. You can change the flowers to match your mood, practical! A decorative idea easy to perform, very cheap and easy to do, which will put the good mood in your home!